Find what you're looking for faster. Use this site search. Welcome to the Pit Bull Community Q & A page. Due to the high volume of questions and subsequent backlog, I cannot accept new questions at this time. However, over 150 questions have been asked and answered here. So there's a good chance your question has been addressed. You can peruse previously asked questions below to find all kinds of useful pitbull information. Or use the site search box at the top of the page to find what you're looking for right away. There are lots of training and behavioral questions answered as well as general health and wellness. One area that we do not address on this page is veterinary medical questions. I am not a veterinarian and I have no way of verifying the credentials of others who respond to questions here. Am I the right owner to make my dog happy?! My 2 year old pitbull is not acting like herself! Aggression toward other dogs when on leash. Should I Allow My Tenant to Get a Pitbull Puppy? My pit bull has wandered off--can she survive this weather? Fear that I've failed as an owner. EAR CROP ENTIRELY TOO SHORT!!!! 7 wk old male pitbull with dry nose? Eight year old female pit bull missed her period. Why? Can a person be a responsible dog owner without a fenced backyard? Is scratching the ground characteristic of fighting dogs? Dog is suddenly growling at children. How often does a dog need to go to the bathroom? What supplements should I give my pit bull? How do I keep my pit mix safe on a small island in the UK? I think my pit bull is nuts. Chances a loved dog could turn? My pitbull is showing agression towards my family members now! My 7 year old born deaf female is arfraid to have her picture taken. Why were APBTs banned in England? My pit bull is afraid of storms. Pit Bull Toys - Suggestions? Do Pit Bulls Get "Lock Jaw"? 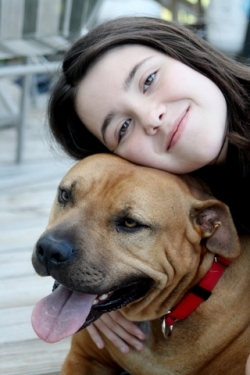 Free Canine Good Citizen Class for Pit Bulls?